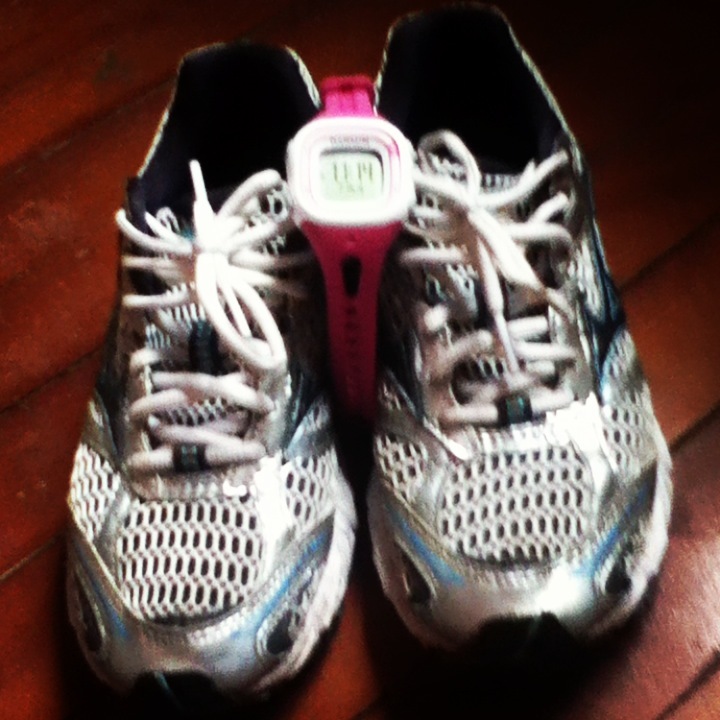 For Mother’s Day, my husband gave me a Garmin Forerunner 10 — a runner’s watch that calculates distance, time, and pace. My previous manner of calculating distance included riding around in the car and mapping out just how far I had run. As for time, I used my trusty Ease Into 5K app. My first time out with my new watch, I simply ran until I reached my goal distance. Unfortunately, I noticed that my mile pace was awful. For my next run, I sought the advice of my husband to remedy the situation. He informed me that I simply needed to keep my eye on the pace time and forget about the distance — to keep my pace steady and I’d run farther than I thought I could. I set a reasonable goal (20 seconds faster per mile than my previous run) and headed out. Keeping a consistent eye on my pace, I ran. Some moments, I found myself running ahead of the goal. Further into the miles, I realized my pace had slowed considerably. But with each glance of the pace time on my watch, I adjusted my speed and found the rhythm once again. In the end, I achieved my goal pace time, and ran my target distance with comfort. I finished. Keeping pace in my spiritual life often feels like my runs without the watch. There are times I stop to take inventory of my heart and mind. When I haven’t been consistently praying, reading scripture, or setting aside quiet times with God, my spiritual pace runs amuck. I’m running too fast, staying too busy to really listen to God’s voice for the day’s “needed” activities; or I’m a sloth that doesn’t get anything accomplished for Him. Time in the Word each day, a consistent prayer routine, and a stronger focus on “things above.” Those moments create the steady pace that will get me to the finish line. And I don’t want to simply finish the race; I want others to start running with me; I want to bandage the injured that I meet along the route and encourage them to get back in the race. Spiritual highs and lows often come because we create them with our lack of consistency. We want to blame God because He seems far away, but that’s usually because we’ve created the distance, not Him. It’s the steady pace that keeps our relationship strong and keeps our legs enduring the distance that leads us to the finish line. How do you maintain a goal pace in your spiritual life? This entry was posted in Personal Devotions, Running, Spiritual Encouragement, Spiritual Sprints and tagged Alicia C. Hall, Alicia Hall, blogger, healthy-living, outdoors, runner, sports, writer on August 7, 2013 by aliciachall28. As usual, a wonderful writing that makes what you are talking about very understanding and inspirational! Keep up the excellent blogs.